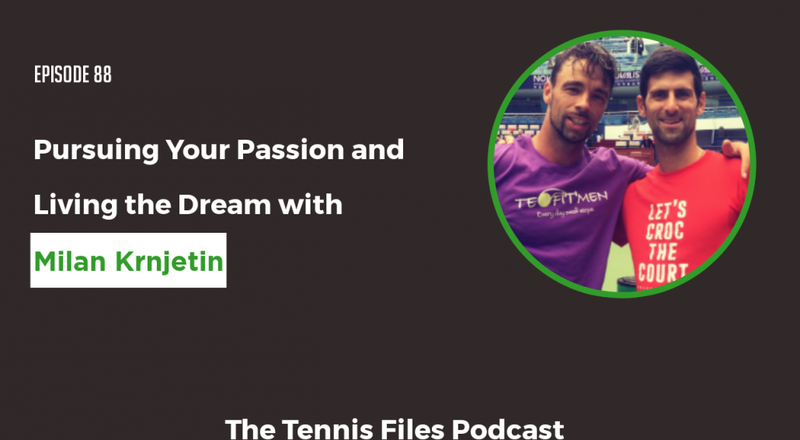 On Episode 88 of The Tennis Files Podcast, I spoke with Milan Krnjetin about his journey from a junior player in Serbia to practices with Djokovic, Kyrgios, Jankovic and many more of the very best players on the planet! We also discuss his fantastic content he is producing as the owner and founder of TENFITMEN. Milan's online platform, TENFITMEN stands for Tennis Fitness Mental. His hometown is Novi Sad, Serbia, and he was ranked #2 in Serbia in the 18s division. Milan eventually came to the U.S. and played college tennis for Auburn University (top 25 program in the country). Milan also played in professional leagues and on the ATP Tour, where he reached a ranking of 1256 in the world. That is no easy feat, and Milan eventually took a huge opportunity to be a hitting partner and coach for such players as Jelena Jankovic and Jovana Jaksic. Milan has also worked with high performance juniors in tennis academies around the world. He now has fantastic content and a great YouTube Channel which details his practices with the likes of Novak Djokovic, Kevin Anderson, Alex de Minaur, Hyeon Chung, and most recently Nick Kyrgios, along with great tips to improve your game. I really hope you enjoy my interview with Milan! Let us know what you think about this episode in the comments below!